Posted by Telangana Utsav in Culture, Hyderabad, politics, Telangana. HYDERABAD: The idea of freedom for old generation Hyderabadis differs vastly from the broad one prevailing all across the nation. Having seen or participated in the Telangana Armed Struggle, they can not readily associate the word ‘freedom’ with August 15 as they do it with September 17, the day the Princely State of Hyderabad was united with the Indian Union through police action. Though the Telangana Armed Struggle has the highest recall value in Hyderabad, it could not have really taken off had there been no moorings in the nation-wide struggle for self rule. However, with the movement lacking support from the ruling Nizam, the situation here was entirely different from the general scenario in other princely states. Lack of momentum was also due to the large scale illiteracy and poverty in Telangana region where 80 per cent of the rural population was landless. The land was concentrated in the hands of Nawabs, Jagirdars, Deshmukhs, and Landlords and the general public was under constant repression. Nevertheless, the nationalist movement had branched off to Hyderabad State as well. A State Congress did exist, but stayed out of harm’s way by considering the national movement only against the British and not against the princely States. It did not win the support of the Nawabs who wanted the status quo to continue. The State Congress, then populated by Arya Samajis, was given very limited social activity. Posted by M Bharath Bhushan in Culture, Telangana, Warangal. The little hamlet of Kalleda in Warangal, Andhra Pradesh, is humming with excitement. 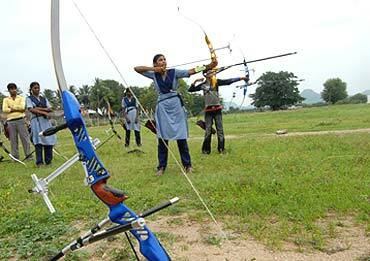 Just by counting the number of times you hear the word ‘Beijing’, you can tell that much of the buzz is centred on Kalleda’s new-found passion—archery—and more importantly, its Olympic debutante, the eagle-eyed, 18-year-old Vardhineni Pranitha.